Another crime adventure from the Pulitzer prize winning Robert Butler. 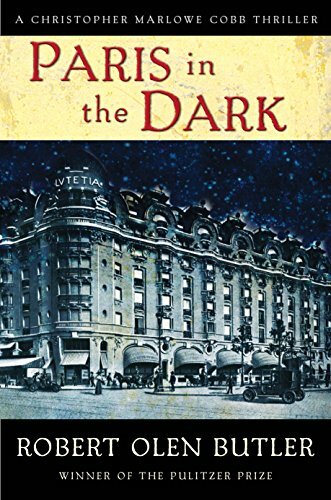 Set in Paris during the First World War, it is infused with the life of this special city, with its aromas, cafes, and fascinating and interesting people walking the streets amid its own unique architecture. Close your eyes to the traffic and not much has changed in Paris. So when the detective hero of the story, Kit Cobb, is lurking for his prey in semi-hidden alleyways, drinking in cafes and bars where the waiter knows your name or racing along cobbled streets many of us know well or pacing the corridors of the famous American Hospital, we can imagine it all with ease. It’s as if we are on the set. Cobb is an undercover agent for the US government, although hiding behind the persona of a newspaper reporter covering the brave American ambulance drivers who have volunteered to go up to the front. Paris civilians are meeting death by dynamite in a string of bombings. The worry is that if there are many more the inhabitants will begin to panic. Cobb speaks fluent German and is just the man to figure out who is the culprit. His colleagues are convinced that the bomber must be one of the supposedly pro French German refugees who’ve been allowed to settle in France. Early on in the story Cobb visits the hospital to look at the wounded after a bombing. There he meets Louise, a taciturn nurse, who captures his attention. The subsequent slow-to-take-off romance gently intertwines with the main story of the book. Cyrus offers to drive Cobb to the front. He’ll get a good story there. They join a convoy of ambulances, engaging in little conversation over the hours of the long drive. Despite the great patches of silence Cobb starts to like him. So like everyone else around he is surprised Parsons disappears with his ambulance. Before long he works out that Parsons is planning a massive explosion inside a big hotel. The culprit is not a German. He’s an American. The chase is on. It’s the standard chase which we’ve read and watched many times, this time ending up in the catacombs underneath Paris. It’s a fun read. Not in the same class as John LeCarre. Not good enough to win another Pulitzer. Still, look forward to the next one—it will be the fifth—in the Christopher Cobb series. Jonathan Power's most recent book is Ending War Crimes, Chasing the War Criminals. He is an author, filmmaker, and a journalist who has interviewed Mario Vargas LLosa, Julian Barnes, James Baldwin, and Jose Saramago for his column in the International Herald Tribune.